When hard-discount grocery chain Lidl brings its low prices to town, incumbent supermarkets need not panic. A study by Catalina finds that while a Lidl store opening siphons sales and customers from area grocers, these supermarkets recover much of the losses and can take clear steps to safeguard their business going forward. In the analysis, titled “Defending Supermarket Share When Lidl Comes to Town,” Catalina examined shopper behavior at 83 supermarkets within three miles of 30 Lidl stores that opened in 2017. The study monitored shoppers across grocery departments and demographic groups for the first 16 weeks after a Lidl opening. Established grocery stores, on average, lost 4.3% of sales and saw declines of 5% in customers and 3.6% in shopping trips. But the impact dissipated as time went on. Sales fell 6.8% in the first month and 6% in the second month following a Lidl opening, yet the decrease shrank to 2.7% by the third month and 1.9% by the fourth month. “While Lidl had a significant effect on competing supermarkets during the first two months after its openings, that impact declined precipitously by the third month, as many trial Lidl shoppers returned to their past shopping behavior,” St. Petersburg, Fla.-based Catalina said in the report. Lidl’s sales impact was apparent in specific product categories, the study noted. Produce, beer and wine represented 60% of the total sales decline, yet were only 16% of overall store sales. Similarly, seafood, meat, deli, frozen, bakery and tobacco accounted for 33% of the sales loss but were 30% of store sales. Meanwhile, the center store saw far less of an impact from a Lidl opening, Catalina found. Shelf-stable grocery and general merchandise accounted for 7% of the sales loss, but those categories were 40% of store sales. With the vast majority of Lidl’s assortment being private brands, it wasn’t surprising that 58% of sales lost by incumbent supermarkets were private label. Still, that loss represented just 28% of overall store sales. Name brands accounted for 42% of the sales loss yet were 71% of store sales. On the customer side, Catalina’s research revealed that existing shoppers — those who continued to shop at their regular store but bought less — represented 74% of sales losses. Shoppers who defected from their regular store at greater-than-expected rates contributed to 22% of lost sales. Four percent of the sales loss was new buyers. “This study demonstrates the importance of shopper analytics in helping retailers keep pace with new competitive threats and changing shopper behavior. Retailers need to pay close attention to how new competitors are impacting their shoppers and respond with the right pricing and promotions strategies to protect and grow share,” explained Tom Corley, chief global retail officer and president of U.S. retail at Catalina, which specializes in shopper intelligence and personalized digital media. Demographically, a Lidl store opening impacted current supermarkets primarily with Hispanic and African-American customers, whose purchases fell 9.2% and 5.4%, respectively. Sales were down 3.7% to Caucasian shoppers and 3.3% to Asian-American shoppers when Lidl entered the market. 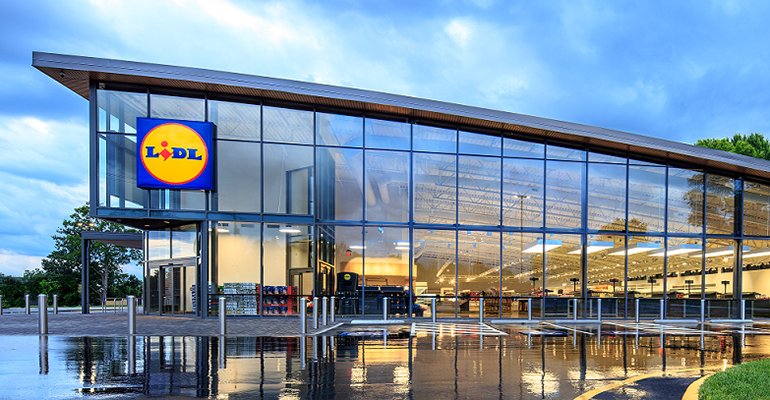 Sales to households with five or more people fell at 127% of the average upon a Lidl opening. Younger shoppers were slightly more likely to reduce purchasing, while shoppers 65 years and older were impacted 25% less than the average. The study found no meaningful variance among income groups. Personalized promotions and pricing — targeting heavy buyers, Hispanics, younger shoppers and larger families — can help incumbent supermarkets defend their market share when they go up against Lidl.